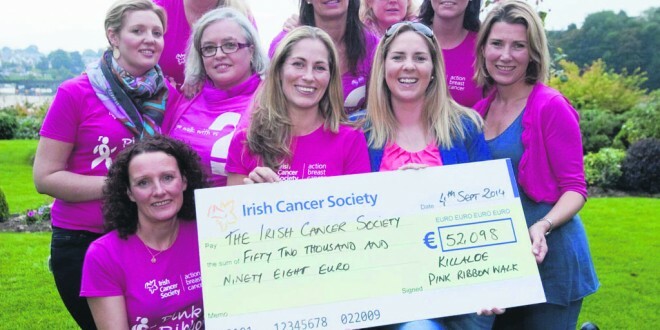 BREAST cancer volunteers in Killaloe and Ballina were tickled pink this week, following confirmation that an annual, local, charity walk has raised an impressive €325,000 for Action Breast Cancer since 2010. Last June, almost 900 people descended on the Shannonside towns of Killaloe and Ballina to take part in the fifth Killaloe Pink Ribbon Walk, to raise funds for Action Breast Cancer, a programme of the Irish Cancer Society. It was the biggest event yet and was made all the more successful by the support received from the local community and businesses. Pink bra bunting hung from the historic bridge, sweets and drinks were handed out all along the route, and every house and shop had pink draped from their door or window. The local committee presented a cheque on Thursday evening to Joanne Murphy of the Irish Cancer Society for €52,098. A committee spokeswoman described the sum as “an astounding amount”, which was testament to the incredible fundraising efforts of all the walkers and runners, who now come from far and wide to be part of this special event. “The community spirit and support on Pink Ribbon Day is inspirational. All our sponsors have helped make it a wonderful day for the whole family. Financial support from sponsors allows us to give more to Action Breast Cancer,” she said. This money ensures the provision of services, such as the Freefone national helpline (1800 200 700), night nurses, counselling and financial aid. 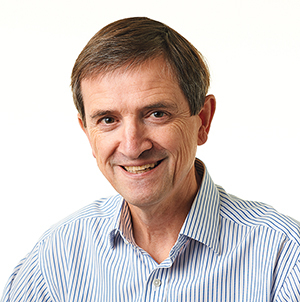 It also contributes to the Breast Predict collaborative research programme. A daffodil centre will also be opening soon at the University Hospital in Limerick (UHL), which provides a drop-in service for patients and family members.